This is Part II of The Scale Series, which explores how brands scale—successfully and unsuccessfully—in the fashion industry. Read Part I if you haven’t yet. In Part I, we looked at the factors that both businesses and brands need to consider when scaling. With this foundation, we’ll now examine some of the failures and some of the successes in the fashion industry. This piece will look at the former, while Part III will look at the latter. Before diving in, it’s important to clearly define what success and failure is in the context of this series. A successful fashion brand balances its creative and commercial aspirations over the long term, which allows the strength of the brand to compound. An unsuccessful fashion brand fails to balance its creative and commercial aspirations over the long term, which deteriorates the brand over time. These definitions intentionally don’t impute any revenue number or business size, since those are all relative. It’s also worth noting that the goal is not to critique brands for the sake of it. These unsuccessful outcomes—some of which generated a lot of personal wealth but disintegrated the brand in the process—are full of lessons about how brands can scale without destroying what made them successful. Overscaling can materialize in many different forms, but we’ll look at some of the most common below. Michael Kors is one of the biggest cases of overscaling. The company, which was built for the young female jet-setter, started in 1981 with the namesake designer fresh out of the Fashion Institute of Technology. He started selling his line at Bergdorf Goodman and Saks, letting the high-end of the wholesale market drive the brand’s growth. The next decade consisted of awards and acclaim in the fashion press, with Vogue naming him part of the “New Establishment” in 1996. In 1997, he was personally appointed as a designer and then the creative director of Celine, which lasted until 2003. During that time, he launched a full-fledged accessories line for his namesake brand in 2001 and a menswear line in 2002. Then, in 2003, things changed. A private equity firm acquired a majority stake in the brand and it started down a different path—quickly. In 2004, the company launched two new brands, MICHAEL Michael Kors, and KORS Michael Kors, which were targeted towards a middle range consumer, compared to the luxury consumer the brand built its name on. These lines were sold in over 350 department stores and boutiques to start. In 2006, the company opened its first retail store, while it continued growing its wholesale presence. During the next decade, it rapidly expanded its distribution. As of 2015, the brand was available in over 4,000 locations, compared to 3,000 in 2013. It has 400 of its own retail stores. Throughout this time of rapid expansion, the brand started suffering as it became wildly overexposed and continued to move down market, further away from where it found success early on. Michael Kors is the leading American fashion designer for luxury accessories and sportswear. The company’s heritage is rooted in producing polished, sleek, sophisticated American sportswear with a jet-set attitude. Whether Aspen, Palm Beach or Capri, our mission is to bring our vision of a jet-set, luxury lifestyle to women and men around the globe. Our products, emblematic of the highest standard of quality, include apparel, accessories and beauty. Our lifestyle-driven company embraces the highest standards of creativity, quality, technology and human resources. Growth itself did not lead to the downfall of the Michael Kors brand. Rather, it was the growth strategy that was unaligned with the brand that made Michael Kors successful early on. The brand’s rapid expansion into department stores—to nearly four thousand at last count—exposed it to a very specific risk: extreme discounting that it had no control over. It’s not a coincidence that the last decade was riddled with overbuying and over-discounting at department stores, a practice Kors became intertwined with. Since most of the discounting was at wholesale doors, there was little Kors could do about it. Even worse, excessive discounting and unsold wholesale merchandise ended up at outlet stores. This diluted the brand even more, as one-time middle market items were selling for a fraction of the price, while the same brand name was affixed to every item. The rise of fast fashion didn’t help either, as companies like Zara and H&M increased the pace of the industry, which further harmed lingering merchandise. While its retail stores all over the world continued to paint the brand as luxurious, seeing old bags on a rack at a Saks outlet store did the opposite. It’s worth considering what would have happened if Kors expanded only via his own retail stores and not aggressively in wholesale. It’s also worth questioning the strategy of diffusion lines that effectively carry the same name as the mother brand but offer much less. Beyond confusing the customer, the micro-differentiation of product lines with this type of naming scheme often brings down the whole brand if one of the diffusion brands suffers or produces bad products. If Michael Kors’ main line is making beautiful, high quality dresses, but MICHAEL Michael Kors is pumping out mediocre product, anything with Michael Kors’ name on it takes a hit from a quality and trust perspective. The lowest common denominator impacts the highest common denominator. There’s simply no separation from a branding perspective with a vertical naming scheme, which Kors employed. For most brands, a horizontal—similar but different—naming scheme seems to be much more successful. The Olsen twins are are good example, with a distinct name for their luxury line (The Row) and a distinct name for their lower priced line (Elizabeth and James). If one of these brands is over-distributed or makes bad products, the other isn’t in trouble. And since the Olsen twins have their names attached—not on—both companies, the brands can benefit from their connection without being tied at the hip if something unfortunate happens. Instead of scaling brands and the naming scheme vertically, the Olsen’s scaled their brands horizontally, and the result seems to be much better. Its also worth examining Kors’ lifestyle expansion. Many brands want to be a lifestyle brand, but it’s really something the brand has to earn. Saying a brand is a lifestyle brand is mostly a hollow statement if the brand equity is not solidified. The other concern is that a brand falls into the Lifestyle Trap, which is best described by New York Times critic Jon Caramanica, who said, “The further away the brand moves from its core strength, the softer the argument it makes for itself.” Caramanica was talking about WANT Les Essentiels de la Vie’s expansion into lifestyle products, but this quote holds for every brand contemplating expansion. Simply put, Kors’ growth strategy was out of sync with the brand, and the results showed exactly that. Kors was able to post 20% quarterly growth since the end of 2011 until the beginning of 2015, but things started going sour quickly. Inventories were up, same store sales were down, and overall store sales were down. The brand rode a wave of extreme growth, and while people made lots of money along the way, the brand suffered substantially since the growth strategy didn’t fit the brand’s promise. Infusing money into a brand, be it a private investment or a public one (Kors had both), creates lots of complexity. It is not good or bad, but it needs to be meticulously managed. With Kors, it was arguably mismanaged and although Kors is an infinitely bigger brand, it’s also an infinitely weaker one. Totokaelo, a multi-brand boutique, is another business that wildly overscaled and ended up breaking its core promise. Totokaelo found success early on selling in Seattle and online. But in 2015, it decided to open a flagship in New York and reorient the brand for global growth. This decision would be a somewhat fatal move, as the company lost its independence and was forced to sell to Herschel Supply Co just over a year after opening in New York. Totokaelo could not have opened its New York store on its own; it did so with the help of a large bank loan, the first external money in a business that was already clocking $17 million in sales in 2015. One of the first rules for scaling a business is that what worked in one place will not work in another. Companies big and small have learned this lesson the hard way, from Amazon in China (which failed), to Uber in China (which has been bumpy [and recently failed]) to Facebook in India (which required a steep learning curve). Simply put, different markets have different conditions and demographics, and replicating something that worked in one market does not guarantee success in the next. At a high level, this was Totokaelo’s biggest problem. It took a highly successful model in the mostly-uncontested luxury market in Seattle and tried to replicate it in New York, which has one of the most competitive retail climates in the world. High rents, cutthroat competition and massive product saturation makes differentiation both challenging and expensive. Totokaelo overscaled its brand by entering a market where it was never going to mean much. The retailer’s main value proposition was offering a superior assortment and level of service compared to any other store in the Seattle area. This premise scales to other second-cities that are full of shoppers with good taste and money to spend, but who are currently underserved. Think Seattle, Chicago, DC, Dallas, San Francisco and others. New York simply doesn’t fit this description, since the Totokaelo customer is wildly over-served. In order for the retailer’s brand to mean something as it grows, it needs to grow in markets that are adjacent to where it succeeded in the first place. Totokaelo had to pair back its global ambitions because of overscaling. Trying to take on global cities put it in a much more precarious place than it was before. At the end of the day, Totokaelo is no longer an independent company with eight figure revenues that was almost wholly owned by its founder. If it had stayed on course, it might still be thriving. The real loss here is independence, and being sold versus bought. Overscaling can happen to all types of businesses with all types of funding sources, and funding decisions have profound implications on every aspect of a brand. It doesn’t just apply to billion dollar brands such as Michael Kors; scale is always relative to the brand in question. The most recent explosion of overscaling has been Kit and Ace, the company that Chip Wilson, the founder of Lululemon created with wife Shannon Wilson and his son JJ Wilson. It started with one store in 2014, but the plan was always to go big. “We do have a very aggressive growth plan because we want to be first to market in this,” Shannon Wilson told Reuters in late 2014, less then a year into the business. Apparently she wasn’t kidding. That same year, the Wilson’s announced plans to take on $300 million in debt to open 95 more stores by 2019. In March 2014, the company had four employees, and in October of the same year it had 130. In 2015, the company had five stores and was operating off of a $7 million investment from the family. Today, the company has opened 30 stores. But this expansion created a lot of problems. The company cut 10% of its staff in February and just cut another 20% in September amidst a company-wide reorganization, proof that the brand’s ambitions outpaced reality. What happened to Kit and Ace? In 2014 Shannon Wilson and JJ Wilson created Kit and Ace for those full-contact days – days that start with a hike at dawn and end with a red-eye. We believe what you wear affects your day – it can hold you back or keep you moving. You need performance and functionality for every part of it, not just at the gym. We applied our expertise in technical design to clothing that suits how you actually live – pieces you can throw in the wash again and again, that stand up to the fullest days. Whether you are biking to the office, playing a pickup game at lunch or dashing to make your connection, what you wear never stands in your way. The most interesting part of this statement is that the brand is for “full-contact days – days that start with a hike at dawn and end with a red-eye” and “biking to the office, playing a pickup game at lunch or dashing to make your connection.” It seems that Kit and Ace is built for the very small addressable market of people who go hiking and then take red eyes in the same day and also play pickup basketball at lunch. Personally, I don’t know anyone like that. Regardless, this would be fine if Kit and Ace was going to be a niche activewear brand. The problem, however, is that the Wilsons tried to scale it as if it was a mass-market brand for a mass-market audience. Additionally, the brand didn’t have a sturdy foundation before it started rapidly scaling. This means that Kit and Ace was quickly replicating a brand that was not resonating with product that had a small addressable market. Replicating something very few people want is problematic, but evolving is even harder when you have 30 stores with rent and staff to pay. It would have been much more prudent to experiment with a store or two and get the brand promise right before scaling up. Shannon Wilson’s comments in 2014 about being first to market should be troublesome when launching a new brand in a new category. There is always uncertainty, and going big does not always work. 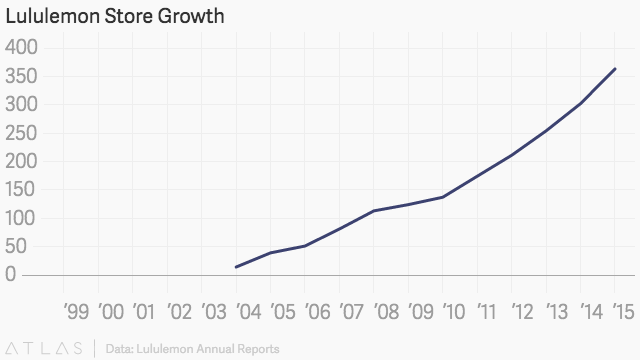 It’s also worth noting that Lululemon, the Wilsons’ first massive success, took its time to scale. Lululemon opened its first store in 2000 and only opened fourteen stores over the next five years. From there, after it nailed the formula and established the brand, the company started scaling more rapidly and opening stores all over the world. Taking it slow early on as the brand finds its footing is crucial, and Kit and Ace simply tried to rush this process with troubling results, not to mention a different product in a different market. There are many other examples of overscaled brands. The goal of this piece was to highlight a few notable cases that are ripe with lessons for other brands to avoid the same fate. Most importantly, it should be clear that the type and amount of capital used to grow a business has a massive impact on the brand, the company and its culture. Money is like gasoline. It works to blow up something that is already kindling. But if you dump gasoline on an unlit fire, you just end up wasting lots of gasoline. In Part III, we’ll look at some brands that have stayed intact while scaling far beyond their starting point.